I am a big-time lover of spring dosa. I can eat it at any time of day. I particularly love the one you get at the Shiv Sagar outlets in Mantri Mall and Forum. ‘This couldn’t be too hard to make at home,’ I told myself the last time I had the dosa at Shiv Sagar. I promptly proceeded to try my hand at it at home, and it turned out slurpalicious. Honestly. That picture does not do the taste of it justice. It might not be the most presentable dosa, but it was my own and it tasted wonderful, customised to my own tastes, if I might say so myself. It is quite simple to prepare as well. 1. Grind the chillies and coriander in a mixer to a paste. Add a little water if necessary. Keep the chutney aside. 2. Heat a little oil in a kadhai and add the chopped vegetables to it. When they start cooking, add the salt and sugar to taste and cook covered for about 5 minutes. When the vegetables are almost cooked, add the vinegar to them. Mix well. Take off from heat and keep aside. 3. Make dosas on a dosa grid, cooking both sides evenly. 4. Put each dosa on a plate, white side up. Spread the green chutney over the dosa and sprinkle some grated cheese over it. 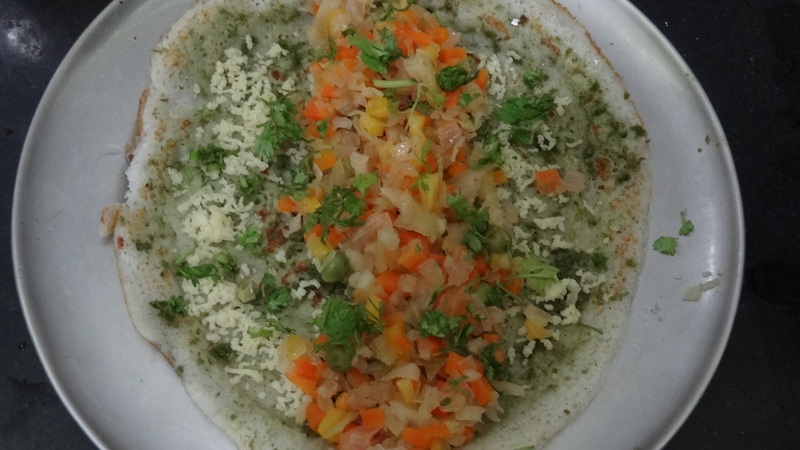 Arrange the vegetable mix in the centre of the dosa. Sprinkle some finely chopped coriander over it. Close the dosa so that it forms a roll. That’s it – your spring dosa is ready to dig into! This can be served with coconut chutney or sambar, but it doesn’t really need any accompaniments. PS: 1. I have seen some people using tomato ketchup and soya sauce to make the vegetable mix. I found this version easier and tastier. 2. I don’t know if white vinegar has any adverse effects on health, though I used it in a very small quantity only. If anyone is aware, please to enlighten me. I don’t think we have Sankalp in Bangalore. But i can understand you not going to Sankalp, when you get better southern cuisines at home, why would you want to go out to it that?! I too rarely went out to eat Gujarati Thali, while people Oohed and aahed about it, i thought my mom can make better food than this, why should i go out and eat it outside?! Looks lovely 🙂 Somehow I had this idea of dosa for yesterday’s dinner 🙂 coincidence eh? Do let me know your recipe for spring dosa. Would love to know. Yes, I think you could use lime juice too. I used vinegar because the dosa at Shiv Sagar seemed to have it and not lime juice. yummy dosa …. i m drooooooling…. i ll give this recipe to my wife,……. I m not a regular writer…..
getting motivated by the kinda stuff people pen…..
Am yet to have my lunch, and you have made my mouth water. I’m certainly going to try this. I love the Shiv Sagar dosas too! Do try it out with mint. I think that would add a different kind of flavour to it. I add vinegar to make the curry tangy, as they do at Shiv Sagar. I think you can do without the vinegar if you are OK with the curry not being tangy. The recipe that I used gave me dosas that were a mix of tangy and spicy tastes. it looks yummy and I’ve decided tomorrow I’m going to make it 🙂 will keep you posted! I thought of adding cumin to the chutney, but then decided against it as I wasn’t sure how it would taste with the dosa. It is Chinese, you see! 😛 Same goes with the coconut. I didn’t add lemon as vinegar already makes the vegetable mix tangy (read khatta). Good to know about the white vinegar. 🙂 Thank you! no of course I meant adding cumin and coconut for other times…not for Chinese dishes or other 🙂 try it for regular food and tell how did it go..
loved this one..am going to try it and make it a part of the Julie/Julia project..chalega na? Do try it out. It is quite simple to make.